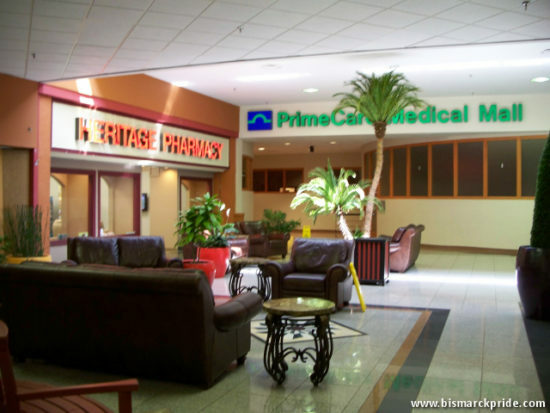 Gateway Fashion Mall is an enclosed regional shopping center anchored by Harbor Freight Tools, Jo-Ann Fabric, and the PrimeCare Medical Mall. AMC Theaters (formerly Carmike and Midco) operates an eight-screen movie theater inside the mall, which was once the largest theater in the region when it expanded from three screens in 1994. Several outlots support Gateway, including Hobby Lobby, Gate City Bank, and numerous restaurants. 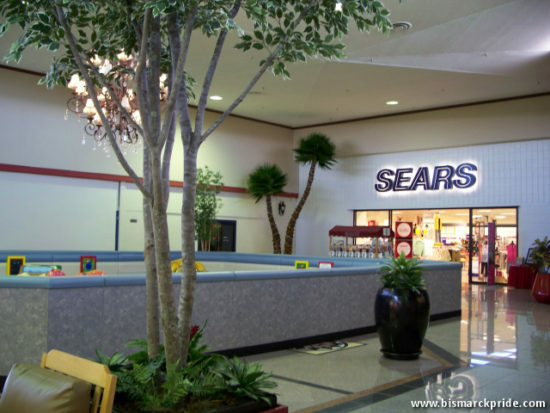 Sears, the last surviving original anchor, closed in April 2018. 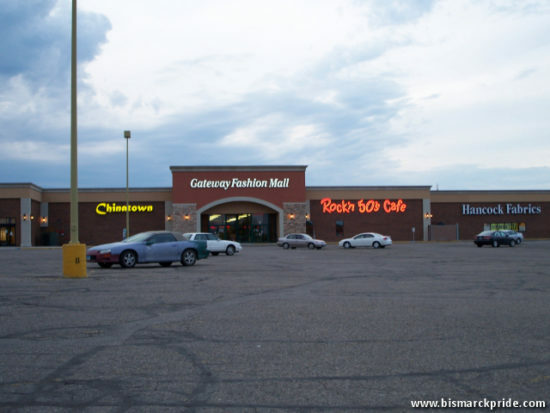 For most of its existence, Gateway Mall was a fully enclosed shopping center. 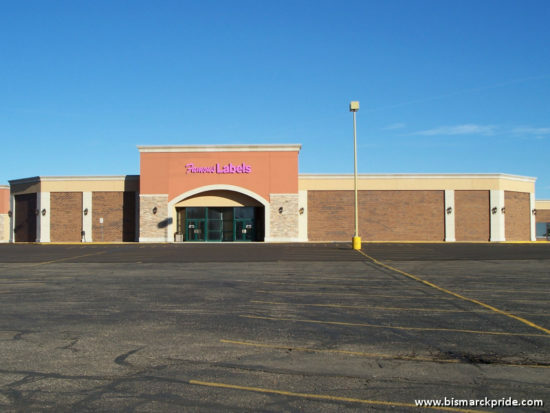 However, recent renovations and store alterations have closed off interior mall access to many of the tenants, including Jo-Ann Fabric, Harbor Freight Tools, and the upcoming Planet Fitness. Gateway Mall opened in 1979 with anchors Sears, A.W. Lucas, and White Mart. Osco Drug – a junior anchor – was the first store to open at the center, in May. The mall itself opened in August with a Grand Opening in September. White Mart didn’t open until February 1980. 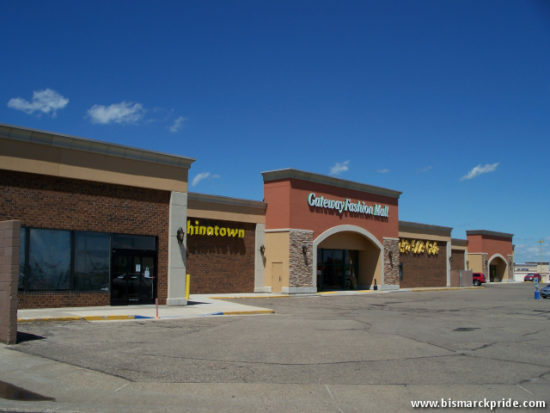 Gateway Mall can be largely attributed for establishing a solid economic foundation along the State Street Corridor, near the US Highway 83/Interstate 94 interchange. A diverse commercial mix ultimately surrounded the center that included financial institutions, retail stores, restaurants, offices, and residential units. Gateway was the region’s third fully enclosed shopping center, following Northbrook Mall and Kirkwood Mall. 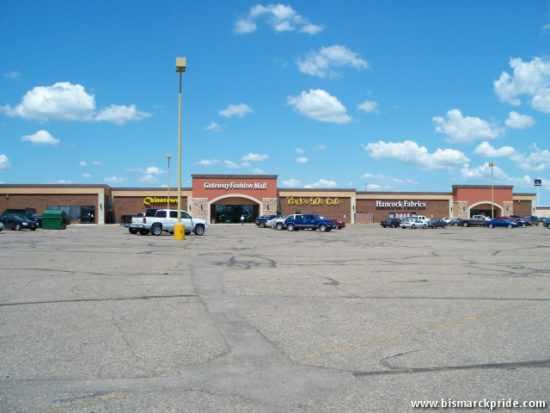 Although not fully enclosed, Arrowhead Plaza was Bismarck’s first shopping center. Gateway, like the larger Kirkwood Plaza, also helped contribute to the downtown migration, with many of its original tenants, including all three of its original anchors, previously located downtown. Most of these tenants shuttered their downtown locations upon relocating, with the notable exception being White Drug’s “White Mart” addition. Plans for a shopping center on the west side of U.S. Highway 83 near I-94 were first unveiled in October 1968. Century Mall, as it was to be called, was to feature 3 anchor stores and 50 total tenants contained in 600,000-650,000 square feet. Denver-based Century 21 Corp. was the developer behind the proposed $11 million project, which was expected to open in 1970. Several tenants who later occupy Gateway Mall, including White Drug, Maurices, and Orange Julies, were attached to the project, as was a movie theater. 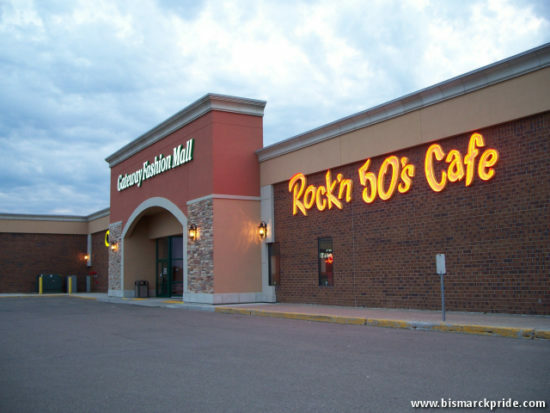 Its developer had planned for similarly designed Century Malls across eight cities, including four in North Dakota: Bismarck, Fargo, Minot, and Grand Forks. 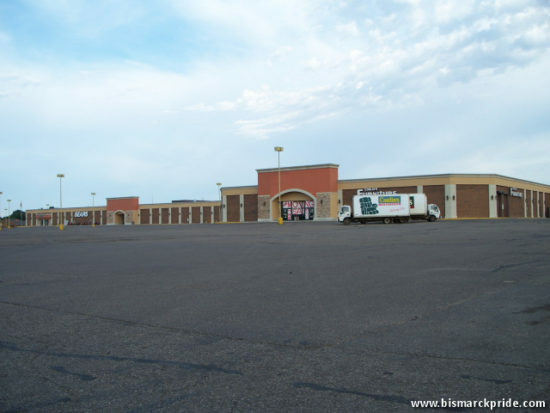 Despite that sites had been secured in all cities, except Fargo and Sioux Falls, and that tenant agreements were struck, none of the malls ever materialized as conceptualized. In 1973, the Kavaney family – owners of the land where Century Mall was to be developed, requested new platting and annexation by the city. This laid the ground work for developing Gateway Mall and other nearby commercial projects. Early planning for Gateway Mall progressed in 1976. In February, Bob Kavaney requested rezoning and re-platting, setting aside 27 additional acres bounded by Century and Gateway Avenues for a proposed major shopping complex. 12 acres to the southwest would be dedicated for multi-housing to act as a buffer zone between commercial and single family units. The developers noted that they could develop the shopping center within the existing 50 commercially-zoned acres, but preferred the additional acreage. Anchors of Gateway Mall were announced in May 1978 and Decom Corp of Minneapolis commenced construction in June. The shopping center was developed by North Bismarck Associates, a key player of which was the Kavaney family, for $8 million. It was 320,000 square feet with space on the mall’s northwest set aside for a future 150,000-square-foot expansion. While that expansion never truly came to fruition, the mall’s later movie theater expansion occupied much of that space. Osco Drug, a junior anchor, was the first tenant to occupy Gateway Mall, on May 7, 1979. Osco relocated from its downtown 4th Street storefront while also maintaining its Kirkwood Mall location. The shopping center itself opened on August 15, 1979, with a grand opening celebration the following month, on September 12. Construction of the mall was still ongoing, with only 30 of the 57 initially leased tenants open at the time. 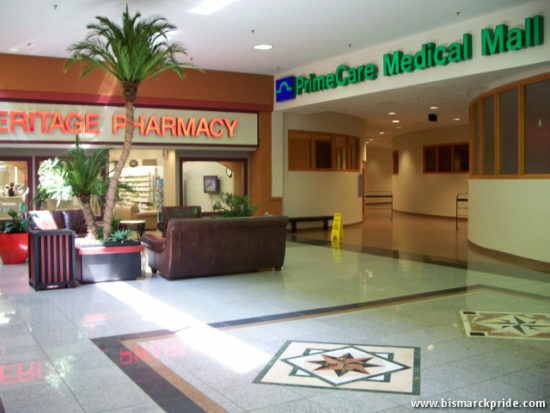 The mall was 100% leased upon completion, with 57 tenants, including the outlots. Some of the tenants originally attached to Century Mall setup show inside Gateway, including White Drug’s new White Mart division and Orange Julius. Junior anchor Osco Drug and three full-line anchors initially supported the shopping center: National department store Sears (89,000 square feet), long-time local department store A.W. Lucas (45,000 square feet), and regional discount department chain White Mart (49,000 square feet). Lucas and Osco were the only occupied anchors upon the mall’s opening, with Sears following in October and White Mart on February 28, 1980. Other original tenants included Jo-Ann Fabrics, Hansen’s Menswear, Lowe’s Garden Center, Lund Jewelry, Midwest Vision, Musicland, Radioshack, Regis, Maurices, Barker’s, The Cheddar Box, Walkers N Daughter Jewelry, Richmond’s Bootery, Bob’s Photo, Meredith’s Craft and Hobby, Merle Norman, Perry’s, The Jeaner/Young America, Kinney Shoes, and Clowntown. 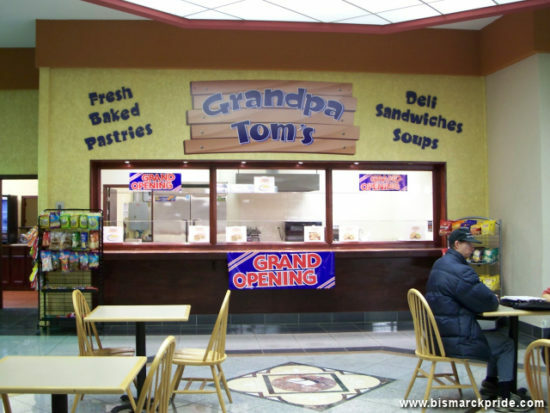 Its designated food court housed five fast food restaurants: Orange Julius, Taco Tina, Turn of the Century (a fast-food delicatessen), Pop’s Ice Cream Shoppe, and an unnamed snack bar. On the perimeter outlots, Perkins, KFC, and Gate City Bank were initial tenants. After 83 years in business, A.W. 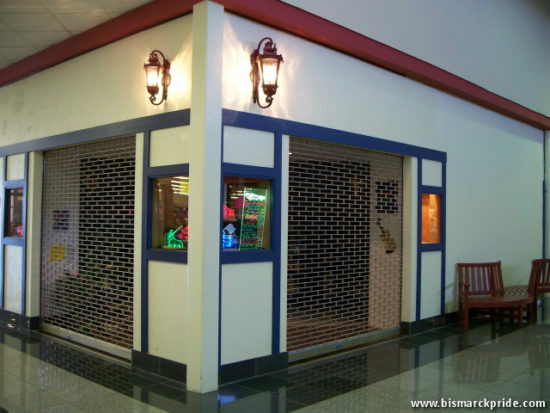 Lucas permanently shuttered in summer 1982 – less than three years after Gateway Mall’s opening. By October of that year, the space was taken over by Moorhead-based Eckstein Department Store, which was purchased by Herberger’s the following year. 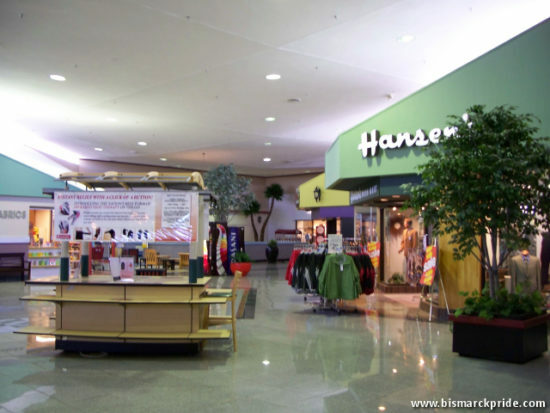 Herberger’s, too, departed in late 1993 upon expanding its Kirkwood Mall store. Company representatives at the time cited Gateway Mall store’s inadequate size as a reasoning in closing. After the departure of Herberger’s in late 1993, the space witnessed ongoing turbulence for decades. 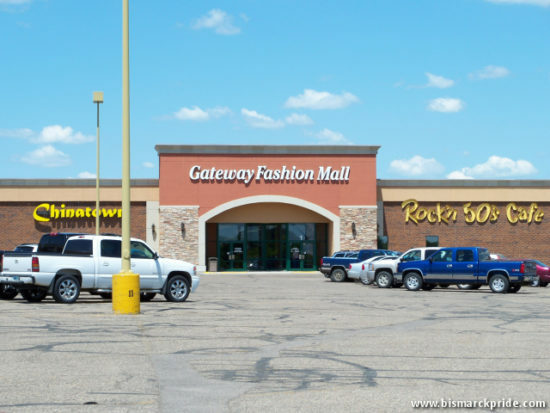 By 1984, North Bismarck Associates sold Gateway Mall to a Los Angeles investment firm called First Equity Group. In 1985, Midcontinent Theaters established a 3-screen movie theater at Gateway Mall. The theater company also owned downtown’s Dakota Twin at the time. The theater expands to 8 screens – then the city’s largest – in 1994. Cost of its construction was estimated at $500,000. The first films screened were St. Elmo’s Fire, Sylvester, and Lifeforce. With the additions of House of Sund pet store and Wisdom House Toys in October 1991, Gateway Mall had only one non-leased unit, with management predicting that the center would return to full occupancy by 1992. For the moment, Gateway Mall was a thriving shopping center. News of Herberger’s impending department first came in June 1993. It was the seventh store to announce vacation from Gateway with a year. Like Herberger’s, two of those closures were in response to consolidating at Kirkwood Mall: Walker N Daughter’s Jewelers and Midwest Vision. Another, Petites For You, was consolidated with Gateway’s Lady Hansen. On the other hand, Gateway’s movie theater underwent a $2 million remodeling and expansion, from 3 screens to 8. When completed in 1994, Midco 8 was the largest movie theater in Bismarck. Midcontinent Theaters shuttered its downtown Dakota Twin at this time. 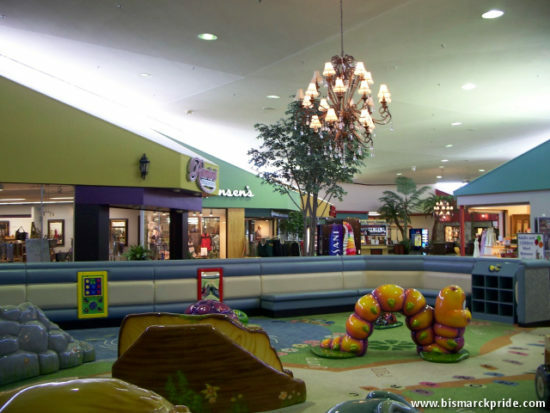 Gateway To Science Center is also established at Gateway Mall in 1994. Burger King was also a recent addition to Gateway’s outlot. From 1995-1999, the center anchor was occupied by regional close-out/deep-discount department store Jacobs Trading Company (later called World’s Greatest Deals). Upon its closure in 1999, Gateway was unable to attract a permanent replacement for the center anchor until Conlin’s Furniture occupied it in 2004. 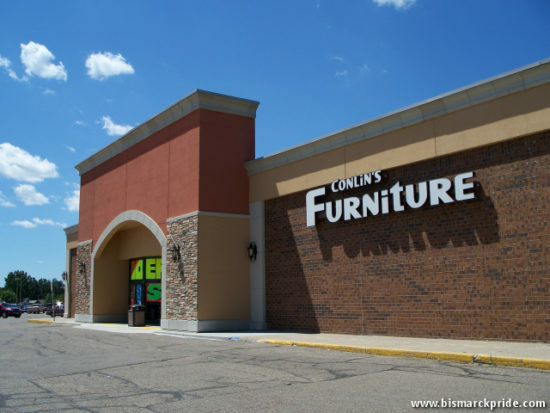 Despite shuttering its long-standing downtown store in favor of its new Gateway Mall location, Conlin’s tenure at the mall was short lived, relocating in December 2009 to its present location. This left the center anchor, again, vacant. 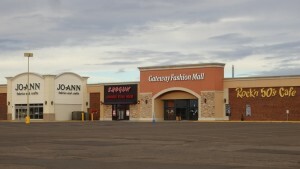 In March 2010, Gateway Mall announced that Famous Labels, an off-price retail chain, had signed a lease to occupy the south anchor space vacated by Conlin’s Furniture months earlier. Famous Labels opened in November 2010, only to close in February 2012. For the next three years, the south anchor again stood mostly vacant, until the opening of Harbor Freight Tools in 2015, which only occupied a small portion of the anchor. White Mart closed in 1986 shortly after its parent company merged with Minnesota-based Thrifty Drug. The former White Mart space was soon after replaced by home improvement chain Menards. 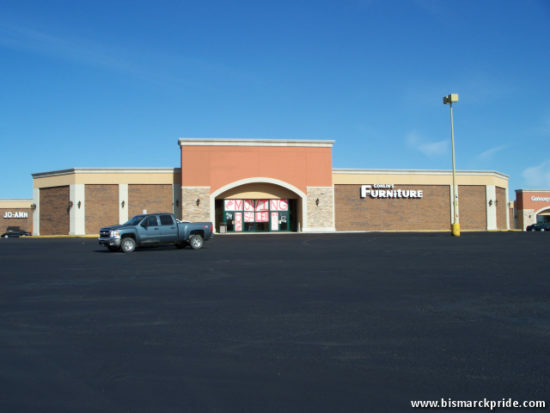 The space was slightly enlarged to house Menards, forcing four tenants to relocate. Menards vacated in 2000 after building a freestanding store just north of the mall. In 2003, Hancock Fabrics relocated into the remaining former Menards space from a location across the street from Kmart. Hancock shuttered all of its stores in 2016 and (as of March 2017) has yet to be replaced. 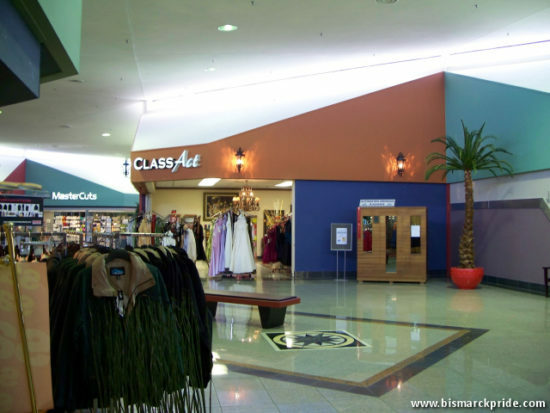 Between 2003-2006, Gateway Mall was sold a total of three times: Santa Ana, California-based Triple Net paid $12.4 million for it in January 2003, who sold it for an undisclosed amount to Utah-based VP Investments in 2004. 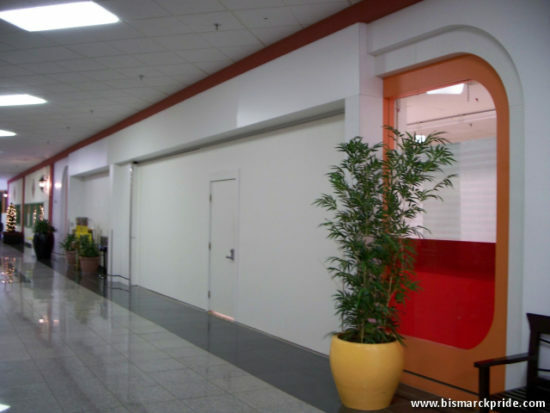 Other targeted improvements included relocating the food court to make room for an additional anchor, speculated to be Macy’s; however, this never materialized. 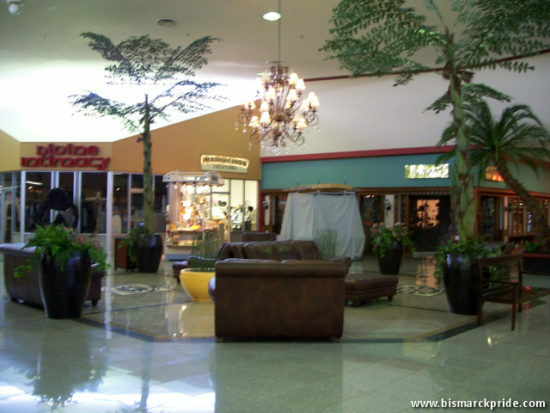 By November 2006, it was reported that Gateway Mall was 100% leased, for the first time in many years, and things appeared promising for the newly reinvented shopping center. The remodeling project completed in 2009, which included a new exterior facade and interior cosmetic upgrades. CVS/pharmacy, an original tenant (as Osco Drug), departed Gateway Mall in February 2009 upon relocating into a brand-new freestanding store. This would prove to be only the first blow to the shopping center in 2009. 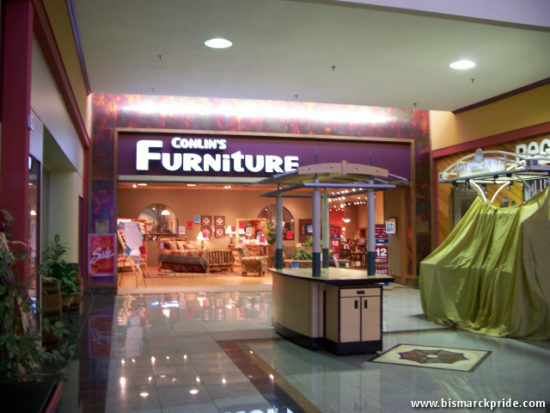 On June 26, 2009, Conlin’s Furniture and Joy’s Hallmark both announced that they were departing. This marked the fourth time a major store had vacated the south anchor space, originally occupied by A.W. Lucas. 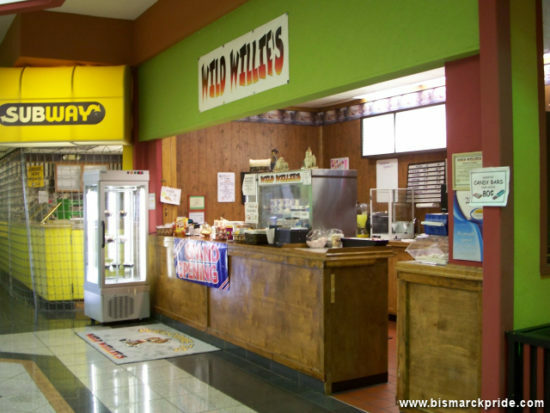 Joy’s Hallmark, who also maintained a location at Kirkwood Mall at the time, had been a tenant at Gateway Mall for over 20 years. In July 2009, the owner of Joy’s Hallmark filed a lawsuit against Gateway Fashion Mall’s owner, Raymond Arjmand, with allegations of fraud and misuse of money. Not longer after, it was revealed that Arjmand was facing similar lawsuits at two malls he owns in California. The Joy’s Hallmark lawsuit was dismissed in February 2013. Hansen’s Menswear, another long-time tenant, departed in October 2009 upon relocating. By the end of 2009, Gateway Mall’s position once again seemed grim, with vacancies approaching record levels that includes empty anchor and junior anchor spaces. 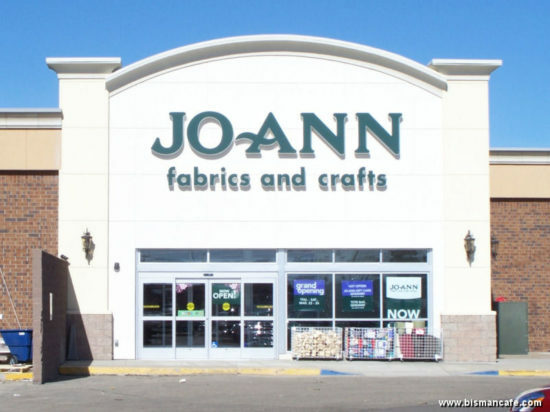 In March 2012, long-time tenant Jo-Ann Fabric and Craft relocated into into the former CVS/pharmacy space, left empty since CVS’s departure in February 2009. Surprisingly, the interior mall entrance to the store was closed off, allegedly due to a dispute with neighboring Hancock Fabrics. It was at least the third time the fabric and craft retailer relocated in the mall. 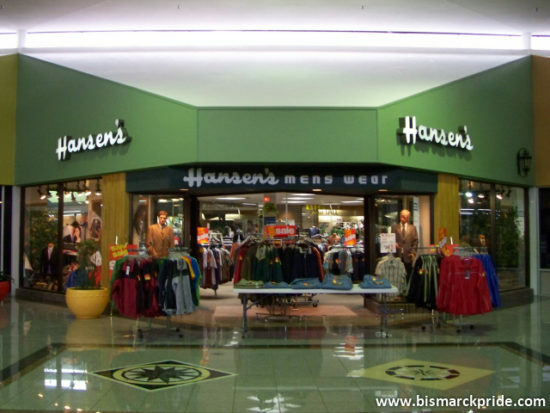 It was initially housed immediately outside of White Mart, then later next to Hansen’s Menswear at the center of the mall (who too later relocates). It relocated into its longest-tenured home, that immediately before the former CVS space, in 1980, tripling its size. That space was originally 7 separate spaces housing Nutrition World, The Cheddar Box, Clown Town, Perry’s, and Bismarck State Bank. 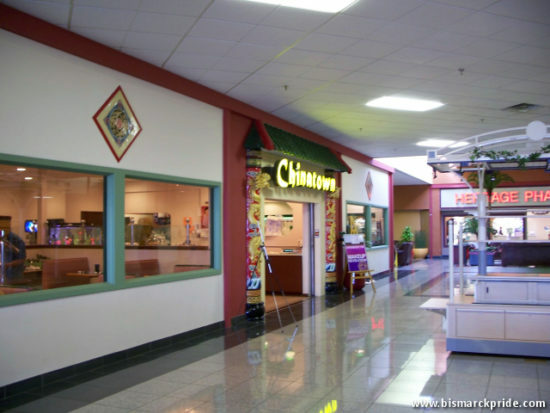 In May 2014, Sakura replaced Chinatown Buffet after the latter’s lease was non-renewed for unknown reasons. 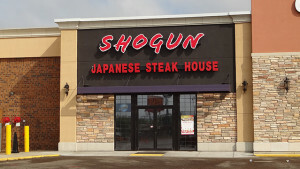 Sakura has since been replaced by Shogun Sushi and Hibachi. In 2015, Longhorn Steakhouse was established in one of the mall’s outlots, while Harbor Freight Tools occupied part of the center anchor. 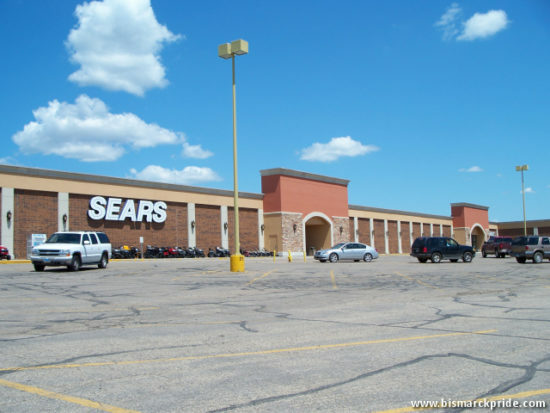 Sears Holdings announced on January 4, 2018 that it was closing its Bismarck store in early April. This results in the mall’s largest space vacant. Planet Fitness will be replacing Hancock Fabrics in 2018. Unique to other local shopping centers, Gateway Mall features a dedicated food court, present since opening. 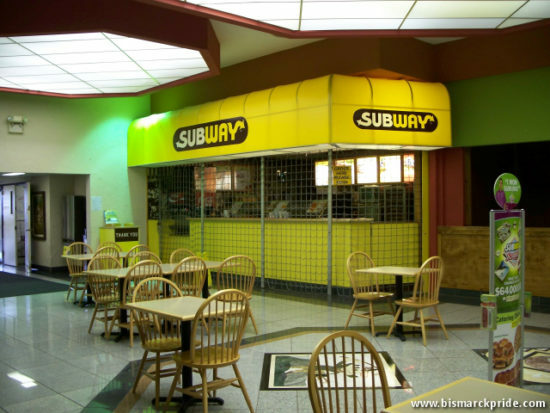 However, the food court has sat largely vacant in recent years. 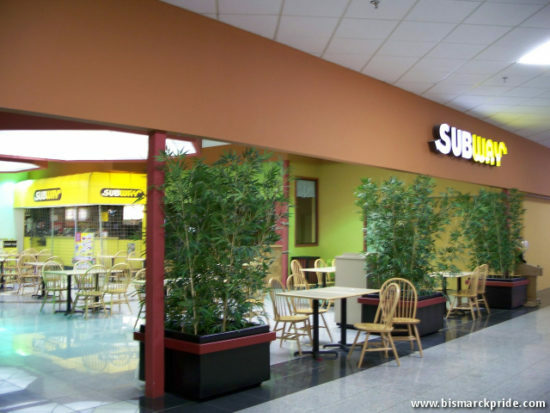 Past restaurants that have had locations within the food court have included Subway, Orange Julius, Papa D’s Pizza, Wild Willie’s, and Taco Tina’s (an original tenant). 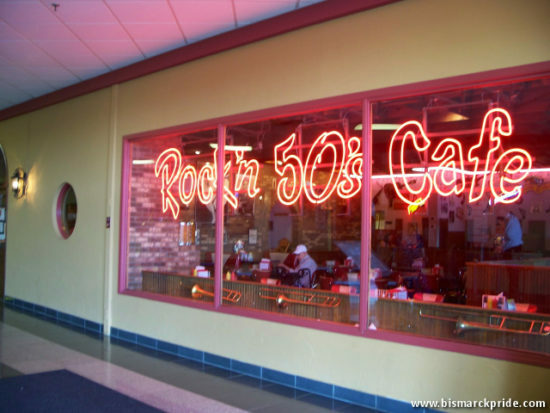 There are, however, two sit-down restaurants located within the center, Shogun and the Rock’n 50’s Cafe, in addition to a coffee shop and BC Bagels. Restaurants located on the outlots include Oahu Hawaiian BBQ & Sushi Bar, KFC, Perkins, Longhorn Steakhouse, and Paradiso. Burger King vacated its outlout in 2012.